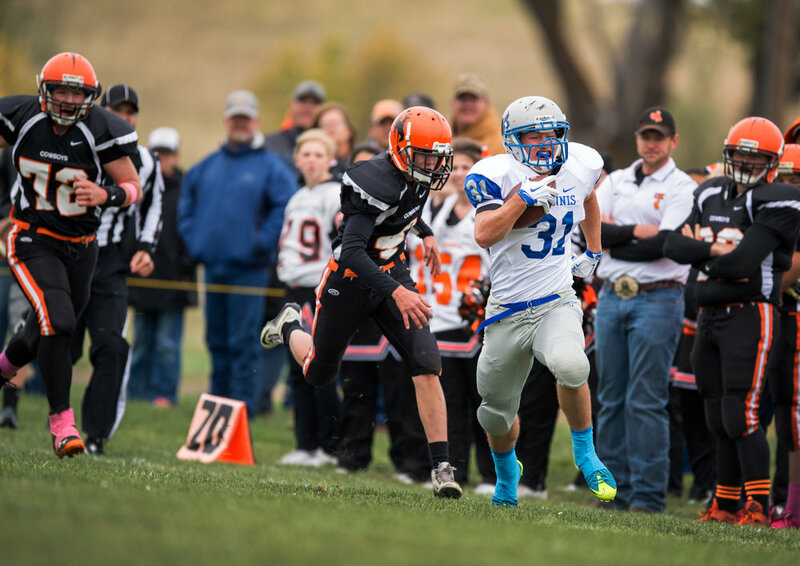 Homecoming week is full of activity in Cody, Nebraska, population 155. There's a parade, a pep rally, the crowning of the homecoming court, a bonfire, a dance and girls' volleyball games, which are as important and well-supported as the football game itself. This is Nebraska's ranch country. There are more cattle than people, and there are really not that many cattle when you consider the number of acres it takes to sustain them. In this part of the country, school consolidation brings students from several towns together to form one high school. Cody and Kilgore, two tiny towns that sit 20 miles apart, are chief among them. The football team is something for the communities to rally around. Everyone is part of the family and part of the celebration of the intersection of sport and rural culture. At Cody-Kilgore High School, they play six-man football, a wide-open game in which literally everybody has an opportunity to handle the ball. There's constant motion and a shorter, narrower field. Five of the six players on offense are eligible receivers. There are only 14 schools playing six-man football in Nebraska, as compared with the 234 six-man teams in Texas. The teams travel long distances for every away game, and crossing hundreds of miles on a bus for one game is not uncommon. Cody is a tough little town. And, as ranchers in the early morning and evening hours and student-athletes during the day, Cody's football players are just as tough. At 1 square mile, Cody is the biggest town in Nebraska's Cherry County. It takes the football players six minutes to run from the practice field, down Main Street and up the hill to the field, which is located on the other side of town. Local dogs are a fixture on small-town football fields. 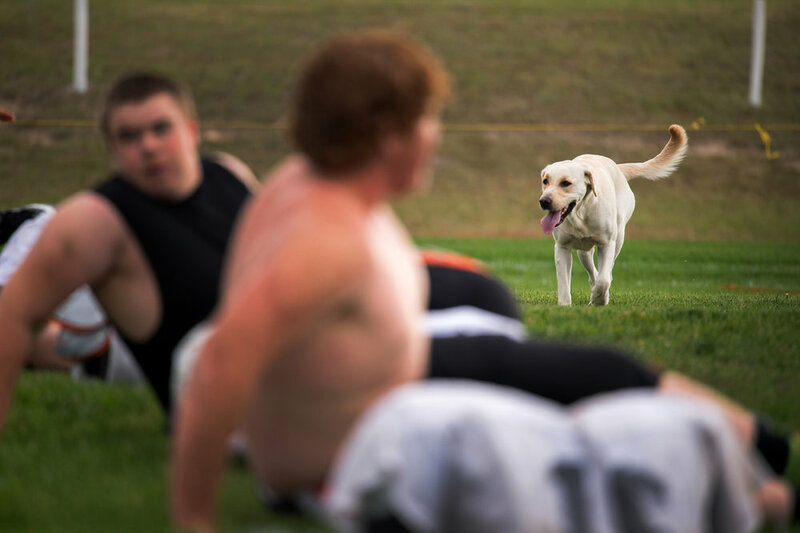 Sunny, eighth-grader Wayon Schneider's dog, watches as high school players stretch before practice. Students often carpool the 40-plus minutes to school, so football practices are always back to back - first junior high, and then high school. Arvidis Henry and Dawson Gourd toss a football back and forth in the locker room before the game. The space the two players take up is about half the locker room. Friday of homecoming week started with a parade that included the school band, one float for every grade, a grand marshal and a cow. It took the group about 40 minutes to roll past the 10 buildings that make up downtown Cody. Alumna Teal Ford fixes her younger cousin True's hair before the game. Most of the graduating class -- no more than 10 or 12 students -- will leave Cody to get college degrees in land management, then come home to work on the family ranch. Homecoming is an event for the whole town, and even the littlest Nebraskans are included. Here, homecoming queen Grace Ford places her crown on 4-year-old Abby Sexson's head. It was raining on the Fourth of July, so the town of Cody saved the fireworks for the homecoming bonfire, held in an empty lot downtown. Almost 300 people from Cody and the surrounding towns were in attendance. To practice agility and balance, coach Landon Miller has players go head-to-head until one player pushes the other out of the fenced-in chute. The fences are placed no more than 3 feet apart, and each fence is about 10 feet long. Coach Miller runs practice after school. Many of the players have to drive long distances home, and they generally work on the family ranch before school and finish their chores after practice. Freshman Brye Szakacs stands in front of the single mirror in the locker room before the homecoming game. Cody's locker room is only about 200 square feet, with one sink, one toilet and one shower. Riley Collier and Sheldon "Slim" Lincoln walk the mile from the football field back to the high school through downtown Cody. The town has a custom bootmaker, a fancy vinegar store where a 4-ounce bottle can cost as much as $25, a livestock supply store, a gas station, a post office, the school, one bar, and a grocery store built and operated by high school students. Homecoming week begins with a dinner (open to the public, $5 for a full plate of food, a beverage and dessert), followed by an auction held by Future Farmers of America and, finally, the crowning of the homecoming court. Riley Collier, center, looks stunned as students around him react to his junior attendant announcement. The high school gym can hold the entire town, and then some. Cheerleaders Lesli Schneider, Tati Jones and Julia Habsburg watch the football players' skits from the stands during the pep rally. During the pep rally, football players are divided into groups, and each group draws the name of a song from a hat and puts on a skit to the song. Here, players perform "My Heart Will Go On" by Celine Dion. Walker Wolff, the homecoming king, is the only boy in the high school who doesn't play football. Cody residents transformed the town's civic center -- itself housed in a transformed shed -- for the school's homecoming dance. Here, senior True Ford dances with freshman Isaac Cook, the youngest kid at the dance. THE WAY WE SEE IT, WITHOUT THE SCHOOL THE TOWN WOULD DIE AND WITHOUT THE TOWN THE SCHOOL WOULD DIE. The team takes a bus from the high school to the football field across town. The trip is less than a mile, but Miller uses the time to give a short pep talk before games. Players knew they were looking at a tough opponent for their homecoming game. The Hyannis Longhorns, who were 7-2 on game day Oct. 2, are led by Gabe Haney, who has already gotten calls from several schools. Jordan Cady, a junior, sits in the front seat of the team bus on the way from the locker room to the football field. Facing a brisk wind, Cody-Kilgore players stand as their school band performs the national anthem before the game. Cody-Kilgore running back Dawson Gourd found it hard to run, let alone score, with Wyatt Rowe draped over him. Scoring in six-man football differs from the 11-man game -- a successful kick after a touchdown is worth two points, and a conversion is worth one. Field goals are four points instead of three. Teams also follow the mercy rule, in which the game ends if one team is losing by 45 points after halftime. Hyannis was a tough opponent, thanks to Haney. The first two times he touched the ball, he scored. The quarterback finished with six touchdowns and 386 yards rushing on just 10 carries. The Longhorns beat the Cowboys 62-19. Despite the lopsided score and cold rain, the players join together in a postgame prayer circle.